MK Yaakov Katz's new bill will stipulate that an Attorney General who refuses to present the government’s position in court will be fired. 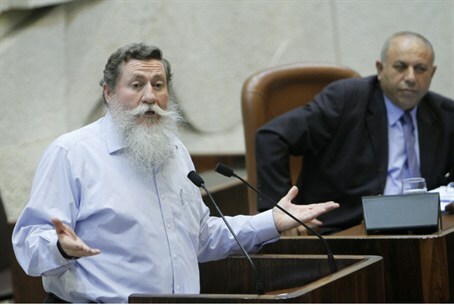 National Union chairman MK Yaakov “Ketzaleh” Katz announced on Sunday that he intends to submit a bill to the Knesset, that will stipulate that an Attorney General who refuses to present the government’s position before the Supreme Court will be fired. The announcement about Katz’s bill came after State Prosecutor Osnat Mandel told the Supreme Court that she is not able to present to the court the opinion of the Ministerial Committee on Settlement Affairs regarding the Binyamin region community of Migron. The committee has said it will not object to a petition by 17 of the Migron families to cancel the planned demolition of their homes. The families said that most of the land was secretly purchased from several Palestinian Authority Arab owners through transactions financed by a U.S. donor. Mandel, however, said she cannot present this position because Attorney General Yehuda Weinstein believes there are legal difficulties with it. “It is time to put an end once and for all to the constitutional anarchy that the Prosecution and the Attorney General create and which outrageously hurt the foundations of democracy and sovereignty of the government,” said Katz. “The people of Israel will no longer stand the existence of a state within a state and the subversion of a group that sees itself as the government of the majority and above the law,” he added. On Sunday, the government asked the Supreme Court Sunday to delay for 30 days the destruction of Migron homes and the expulsion of its residents because of fears of violence during the Arab holy month of Ramadan, which began Friday. The request for the postponement was based on two factors: feared violence and delays in preparing an alternative site for residents. The Court a year ago ordered the Migron homes to be demolished because their homes were built on land alleged to be owned by PA Arabs. Now that most of the land has been bought by the Israeli residents from the alleged owners, the Civil Lands Administration is studying the purchase documents.